A must for every Flyball and Agility club! These collars are adjustable, have a strong handle, and are great for the sports of flyball and agility as a training aid. Enables you to grab the handle for directional use. They have been tested by our training professionals, and have gotten great results!! 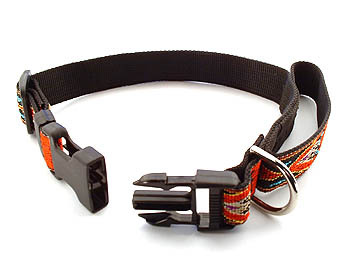 EASY GUIDE is a trademark name of Handcraft Collars, Inc.
Easy to use nylon lock buckle on collars. Nickel plated "D" ring for leash attachment. Measure neck to determine proper size. X-Large: 19"-31" - not available in 5/8"
Patterned Flat Nylon - 1" width. Solid Flat Nylon - 5/8" width and 1" width. Tubular Nylon - 5/8" width. Patterned Flat Nylon lead - 6'- available in 1" width. Small or Large Bolt Snap. Please specify Bolt Snap size when ordering. Solid Flat Nylon lead - 6' - available in 5/8" or 1" width. Small or Large Bolt Snap. Please specify Bolt Snap size when ordering. Tubular Nylon lead - 6' - available in 5/8" width. Small or Large Bolt Snap. Please specify Bolt Snap size when ordering.